Can stores profit from green premium? London, England (CNN) -- Catherine Conway mixes business with passion. Her business is a small grocery shop in central London, and through it, she's working to change the way people behave when they shop. The message is in the name: "Unpackaged." It's a good looking example of a local store but here customers bring their own packaging, like reusable bags and containers. In this shop you refill, weigh, and pay. "Obviously the environmental benefit is very much at the core of what you're doing here," Conway told CNN. "We encourage people to bring their own containers to refill because it has a variety of environmental impacts. It reduces carbon emissions related to packaging and food consumption. It reduces the waste that's going into landfill and has a slightly wider sort of effect on behavior change." The "Unpackaged" idea started as a stall in a market and has grown steadily despite a rough financial environment. Conway, who has had the shop for two years says the business is going great and she is already turning a profit. The shop's suppliers are mostly small and local and the products are organic or fair trade. Shopping here costs more, but the business works because its customers are happy to pay. 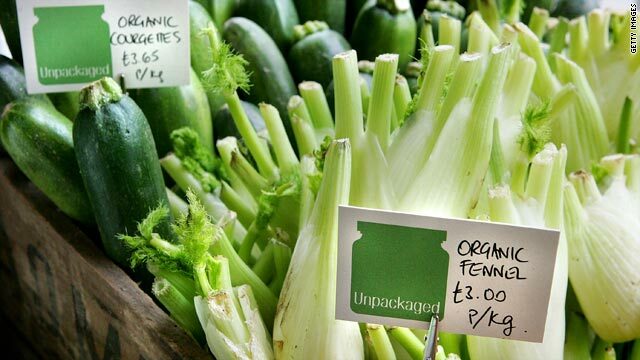 A loyal "Unpackaged" customer told CNN she was "very fond of the agenda of the shop, the recycling and being able to choose your own things and the high quality produce." So at this London store, at least, customers are prepared to pay a little more for a better quality, green product. But across the world, across other industries how many consumers feel the same way? The question was the focus of a survey by the insurance group RSA. Its research across nine countries showed many people are still willing to pay a green premium despite the economic downturn. Paul Pritchard, head of corporate responsibility at RSA told CNN: "I think the thing that struck me most about the survey was the strength of opinion in countries outside western Europe. Chile, China, UAE -- very, very strong interest in these issues and a strong willingness to pay a premium for green goods and services." It's likely there is some difference between what people say in a survey and how they spend their money, but Catherine Conway believes green-will among consumers is growing, it's good for business and good for the planet. How much are you prepared to pay for organic and fair trade produce and do you think it represents a fair price? Post your comments below.